Go left about 30 feet down the main gallery corridor (toward the Bay). Newton’s Prisms is on your right, along a blue curved wall. Want to make a rainbow? The bright light in this exhibit is a halogen bulb. This light is full-spectrum: it contains all of the colors of the rainbow. Halogen bulbs work a lot like old-fashioned incandescent bulbs. Inside, electricity passing through a thin filament causes it to get so hot it glows. But halogen gas inside allows these bulbs to run at higher temperature, making them both brighter and more efficient than incandescent bulbs. Halogen lights are common in desk lamps, bike lights, upscale retail stores, and car headlights. Try using the flashlight on your phone in place of the exhibit’s halogen bulb. Does the resulting spectrum look different? Go back toward the Explainer Station about 15 feet. Countless Colors will be on your left. Want to mix colors with light? The light you can mix here comes from LEDs, light-emitting diodes, the same as those that illuminate cell phones, computers, and almost all other digital screens. LEDs are energy efficient because unlike halogen and incandescent bulbs, they don’t rely on heat to make light. Instead, their light comes from energy-level transitions in atoms inside a tiny semiconductor sandwich. LED light isn’t full spectrum, but instead “fakes” the spectral colors by blending light of just three colors—red, green, and blue. The forgery is excellent: Red and green combined look just as yellow as “real” yellow to most of us. Try it and see. Remember that flashlight on your phone . 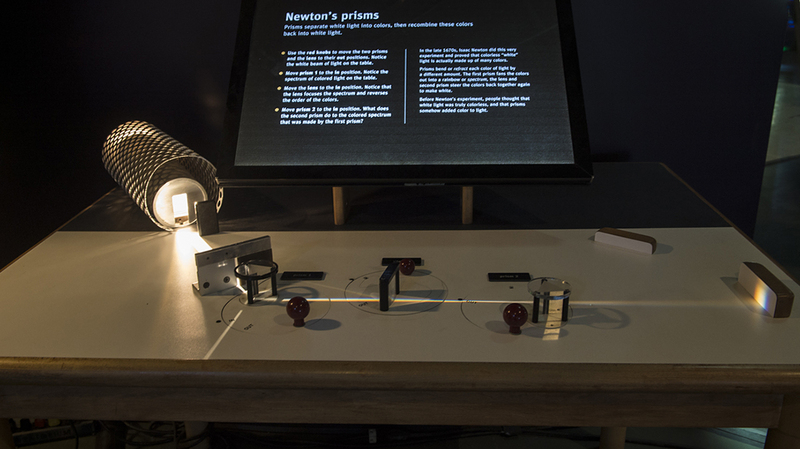 . . it’s an LED—that’s why the rainbow at Newton’s Prisms looked different with your phone than with the halogen bulb. Look over the exhibit and to the right. Fluorescent Tube is in view against a blue corner wall about 15 feet away. Want to see invisible light? As tubes or curly CFL bulbs, fluorescent lights contain mercury gas that emits invisible UV light when electrified. The white light you see comes from a phosphorescent powder that glows in response to the UV light from the mercury gas. Like LEDs, fluorescent lights are energy efficient because they rely on atomic energy-level transitions—not heat—to make light. Here we’ve scraped away half of the powdery coating inside that gives a fluorescent tube its visible glow. Depending on the phosphors used, fluorescent lights can vary in color and spectral richness. 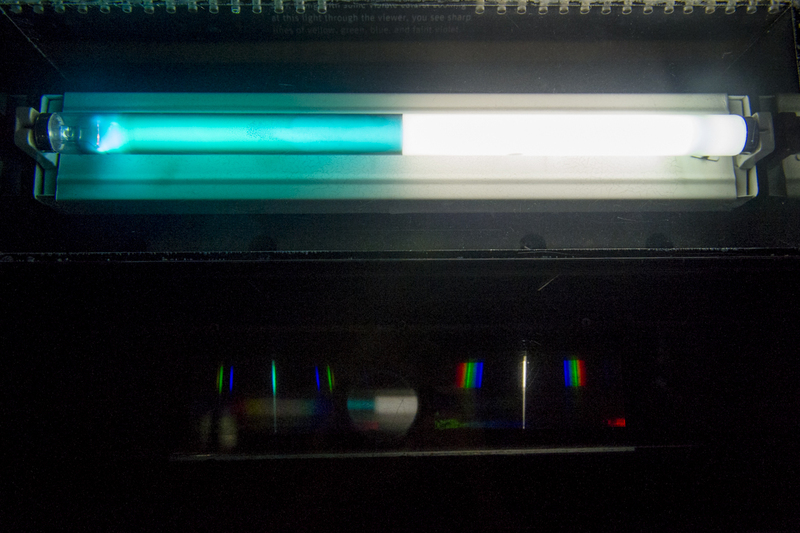 Look just below the uncoated (left) side of the tube at the colored lines that make up the mercury emission spectrum. What three colors do you see? What colors are missing? Look up slightly to the right. Monochromatic Room is in view ahead of you about 10 feet away. Want to see hidden colors? The strange yellow light in this room is monochromatic—it consists of only a single color (or wavelength). Here, sodium gas is electrified and glows thanks to atomic energy-level transitions—much like a fluorescent tube but with sodium gas instead of mercury. Used mainly for streetlights and parking lots, sodium vapor lights are the ultimate in energy efficiency. But since they also make it impossible to see the color of things, their use is limited. 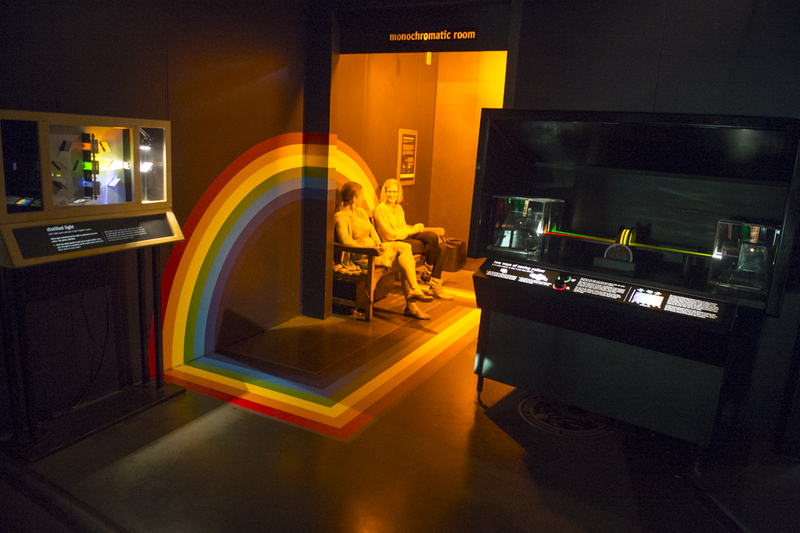 Wherever you happen to be standing, look all around: If it’s a sunny day, you might see rainbows dappling the museum floor or walls. Want to walk in a world of rainbows? 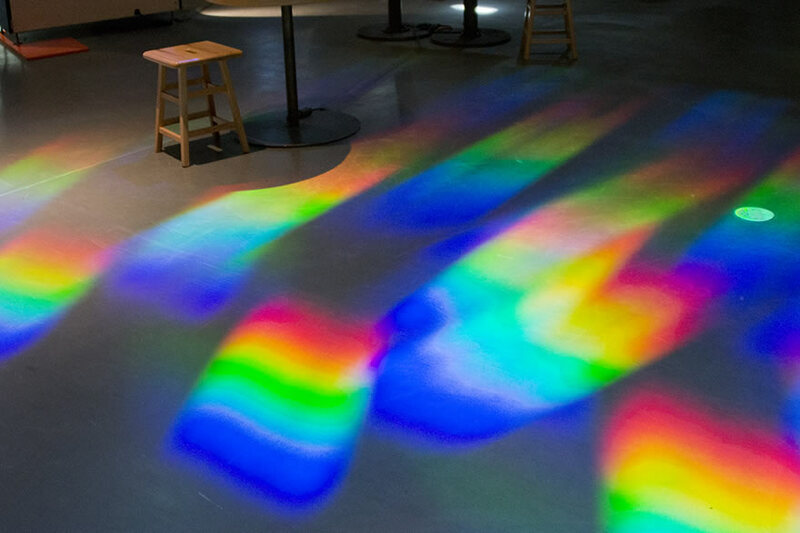 This is sunlight coming through the windows above, spread out into its component colors by a special film called a diffraction grating. Sunlight is the ultimate full-spectrum light—it contains all of the colors of the rainbow. Look carefully at one of the rainbows—can you name all the colors you see? Many of us are taught that there are seven colors in the visible light spectrum—red, orange, yellow, green, blue, indigo, violet—but these names and distinctions are completely arbitrary. In fact, there are an uncountable number of colors in full-spectrum light. This ends our brief lighting tour. 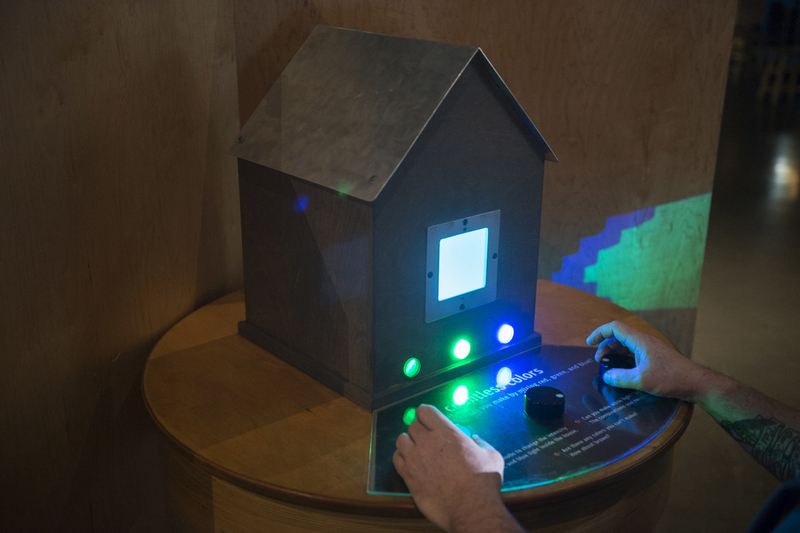 As you explore the rest of the museum and the world beyond, see how many different forms of light you can find.